We have made good progress on many things over the past week, although I am worried that the pre-excavation plans are still not complete (largely owing to confusions with the grid established a few days ago), particularly with regard to levelling. The inner ditch to the west is looking good, and to discover areas of apparent trample and burning inside it seems to show that activities were not just taking place in the centre of the monument. 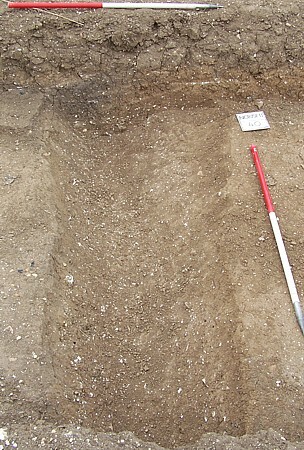 The lack of ceramics within the ditch fills is interesting: this can be contrasted with the large numbers of animal bones. This all looks very like a classic henge. We are also making reasonable progress with the removal of (35). The undulating interface with (59) bellow is intriguing and I wonder if we are looking at evidence of former ploughing. I’m hesitant about ascribing a date to this activity (if it is even real! ), but it is notable that only prehistoric material is coming from the lower part of (35). After removing (31), two new contexts have emerged: (77), an extensive fill, and (78), a small and well-defined patch of burnt soil. It looks as is (78) is overlying (77), but this will need testing; it is also apparent from the section that part of (78) at a higher level has already been trowelled away. And, inevitably, excavation immediately showed that (77) actually overlies (78) and that what was visible was a small part of (78) at a higher level that was never completely covered by (77). Having taken a pre-excavation photograph of (78), it occurred to me that I didn’t photograph  when its excavation was complete, nor was it planned. I have now got proper photographs and it will be planned shortly. The brief shower at lunchtime brought out the colour changes in the soil briefly, but within half an hour, they had dried out. If we are able to open a quadrant of the henge next year, I think that we will need to organise a water supply; a bowser on site would be useful and I suspect that they aren’t prohibitively expensive to hire. It would also be useful to have a secure tool store, as we do seem to spend an inordinate length of time moving equipment at the start and end of the day; this is no-one’s fault, just that the location of the site renders all this movement necessary. A real wish-list item would be to have a site office, where the records could be kept during the day, where finds could be dried and which could double as a shelter in inclement weather. establish the value of the TBM. Considering the weather today, things have gone well. The team working on (35) has shifted three times as much soil as yesterday (it’s possible that there have been fewer finds, but that may not be the case); the pre-excavation plans are finally getting some levels; various minor errors that Caoimhín has spotted have been sorted out; Siân has completed her annotation of the plans of Trench I and is ready to make sure that all the context records for them are up to date. 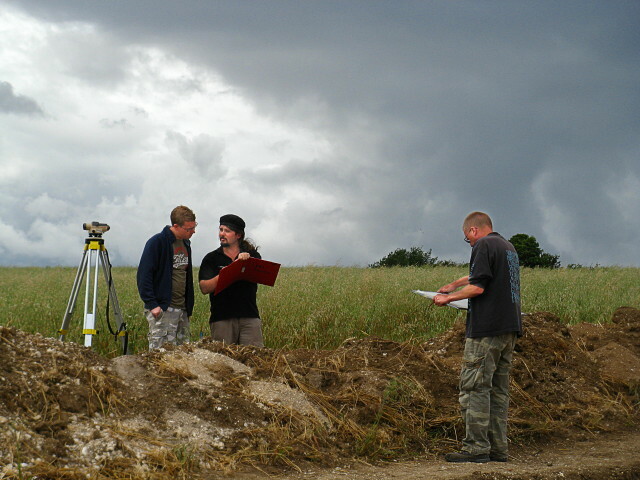 Over the week as a whole, my understanding of the site has been transformed and I am now a good deal more confident about the date and nature of our henge.